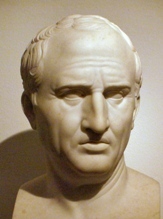 In this creative and entertaining dialogue, Cicero explores the roots of friendship as well as its benefits and pitfalls. Ultimately arriving at the conclusion that nothing save virtue is more valuable than friendship.
" An unjust peace is better than a just war. "